Are you a game player? If you are, I think you know VR game. VR means virtual reality, which is a computer technology that simulates an environment with which user may interact. This technology has been improving to make our life richer and much more attractive. Of course, how fun VR games are! Besides VR games, there are also many VR applications in the market. Oculus, a well-known tech company, acquired by Facebook in 2014. Oculus developed the Rift, which designed many VR apps as well as games. 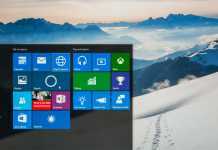 Oculus Rift is as important as normal Windows data. If we want to protect our data, backup is one way. 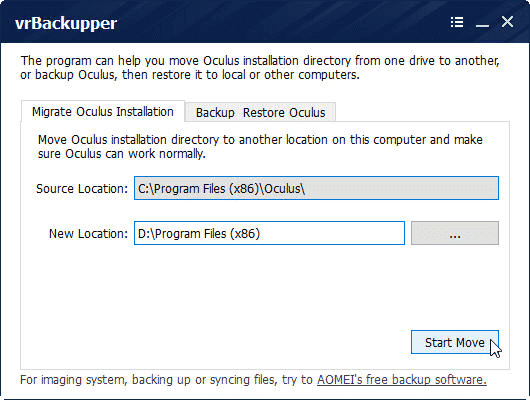 However, there has not Oculus backup software in the word before vrBackupper came. vrBackupper is AOMEI’s product. AOMEI is a famous software company. 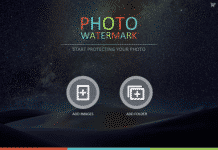 One of Its primary products is Windows backup software – AOMEI Backupper. As you can see both their names contain the word – Backupper, they are made by the same company. vrBackupper 1.0 has only one edition; it is totally free. I have tried it several times, and find it is so easy to handle. Next, I would like to show you in details. Only run Oculus Rift programs but don’t protect the data is not good. Luckily, vrBackupper is a direct backup Oculus Rift tool. When you using Oculus games or apps, you may find many inconveniences. For example, Oculus VR software can only be saved in the installation directory of Oculus and Oculus earlier versions can only be installed on the system partition. Thus, new downloaded games or apps usually encounter a problem that there may be lack volume for installation. Don’t worry; vrBackupper can solve these. Download the freeware from its official website, install and run. It’s main interface as following screenshot shows. In order to move Oculus installation directly to a new location on this computer, you should select a path before starting. Another location even can be an external drive. It is similar to migrate OS to SSD. You can choose a better place with enough space. vrBackupper will not cause your data loss, on the contrary, it is able to make sure your Oculus work normally later. Here, let’s switch to Backup Restore Oculus panel like follows. 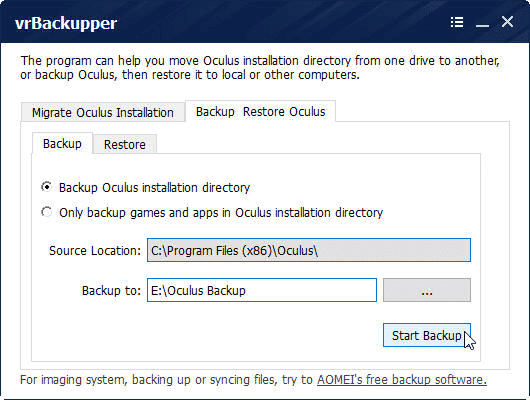 Backup has two methods: Backup the whole Oculus installation directory or backup only games and apps in Oculus installation directory. Decide a destination location then start to backup. By the way, backup games also including configurations: game progress, in-game level, equipment, and gold, etc. Thus even though you restore Oculus installation to other computers, or migrate to a different drive, you can still continue your game from the latest saving point. 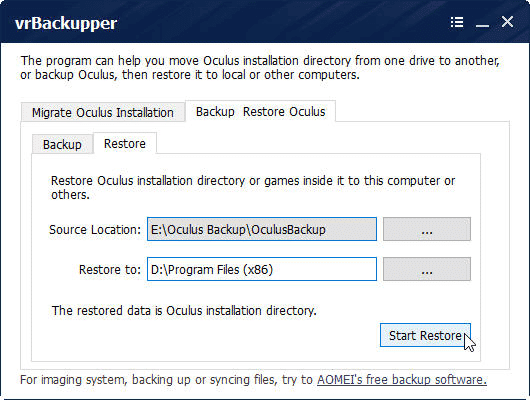 Thanks to AOMEI universal restore technology, you can restore Oculus Rift to another machine. Select the source and destination locations then start to restore. If your new computer has not installed Oculus Rift before, you should install it first. 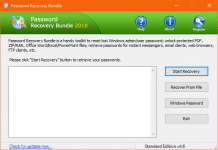 vrBackupper is designed to recover all data as well as personalized settings back, and you don’t need to re-download games and apps. It saves us lots of time. Above content tells us vrBackupper is very easy to use. Its interface and operations are simple, few steps, you can achieve your goal. Obviously, vrBackupper solves us lots of trouble when using Oculus Rift, and make the experience of Oculus Rift even our system better than before. This 100% free Oculus helper is so amazing that we hope every Oculus users could enjoy it as soon as possible.